In a pivotal vote Friday, the California Senate approved $4.5 billion in bonds to begin construction of CA High-Speed Rail (CAHSR) connecting San Francisco and Los Angeles. The funds will help fund construction of the line’s initial segment in the Central Valley and upgrades for the Caltrain and Metrolink commuter rail lines in the Bay Area and Los Angeles, respectively. The vote, which reached a majority by just one senator, came as a major relief to high-speed rail advocates. The project, which has been increasingly scrutinized since voters approved over $9 billion in bonds for it in 2008, could have been scrapped without the approval. Had the vote failed, California could have lost another $3.2 billion in matching federal funds. 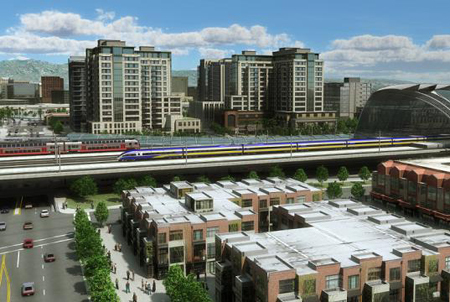 “Building high-speed rail in California could reinforce cities as the hubs of our economies, significantly reduce greenhouse gas emissions, get commuters off congested roads, and cost much less than highway and airport expansion,” said Stuart Cohen, executive director of TransForm, which lobbies for smart growth and sustainable transportation in California. “It will provide Californians with an improved transportation option that has for decades been available in other nations,” added Cohen, who noted that the vote comes exactly 150 years after the Transcontinental Railroad was authorized. Although high-speed rail is popular — and expanding — in other countries in Asia and Western Europe, CAHSR would be the first such system in the United States. The previous plan from the CAHSR Authority lacked support even from TransForm, but the group praised the revised plan released in April, which reduced the project’s cost from about $100 billion to $68 billion, reduced the impacts on communities which it would run through, and provided funding to upgrade Caltrain and Metrolink tracks, which would be shared with CAHSR. “This new plan is simply much better,” said Cohen after it was released. In San Francisco, funds approved in the Senate bill would help electrify the Caltrain tracks by 2019 and extend them to the Transbay Transit Center currently under construction. Friday’s vote was widely praised by SF officials. The approved Senate bill “provides not only the beginning of the nation’s first high-speed rail line that will connect its diverse and growing communities, but also the local connections that will deliver the economic growth from high-speed rail into our towns and cities in the form of travelers be they commuters, tourists or students,” said a joint statement from SF Municipal Transportation Agency Director Ed Reiskin and Chairman Tom Nolan. Some of the bill’s $1.9 billion set aside for local and regional rail projects will also go toward the controversial Central Subway project, which Reiskin and Nolan lauded in their statement, saying that the two projects will connect at Caltrain’s Fourth and King Station. Critics of the Central Subway have questioned the use of HSR funds, as it’s possible HSR won’t stop at Fourth and King. Unclear is where the rest of the funding to construct and maintain CAHSR will come from. As part of the solution, a TransForm report [PDF] recommends that the CA legislature prioritize early funds from the state’s nascent cap-and-trade program for bicycle, pedestrian, and transit improvements around the stations planned in Central Valley cities as well as the Caltrain and Metrolink upgrades. TransForm also recommends encouraging transit-oriented development around those stations, which could provide revenue to fund “high-quality station designs” and public infrastructure improvements. Construction on high-speed rail could be begin as early as next year, and the plan sets the completion date in 2028.